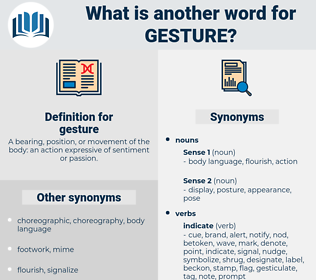 What is another word for gesture? 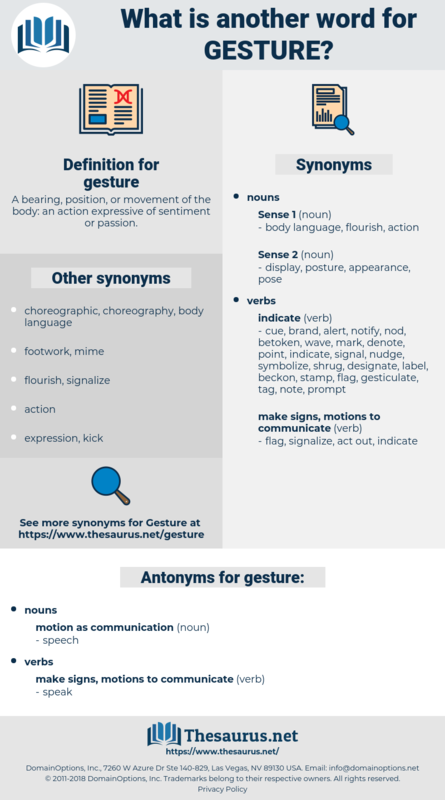 A bearing, position, or movement of the body: an action expressive of sentiment or passion. posture, posturing, step, demonstration, attitude, manifestation, measure, stance, indication, initiative, deed, expression. Van Horn made a violent gesture. Innocent did not like being called a " poor child" - and she gave a little gesture of annoyance. poke, thrusting, jabbing, poking, mudra, thrust, jab, Beau Geste. indication, indicant, motility, move, motion, movement.